It was kind of like a Halloween candy-swapping session, only for grown-ups. Kettlehouse Brewing of Missoula hosted its fourth annual Hop Picking Party earlier this week. It was a perfect opportunity to gather with other beer enthusiasts to help harvest a key ingredient to Kettle House’s premium brews while simultaneously depleting their existing stock. My friend Jim was there, gamely diving in to separate the fragrant humulus lupulus flower from the skin-slashing vines laid out on the Northside brewpub’s many tables. Jim likes a frosty glass of oat soda as much as the next guy (unless the next guys is this guy, and I like beer even more than I like America), but his interest in the K-hole hopfest was more scientific. He’s a moonshiner. Or, more properly, a zymologist (from the Latin, “humiliator of grain”). When I say moonshiner, I don’t mean like the guy in “White Lightnin’”, some dentally-challenged hillbilly who swapped his adolescent daughter for fifty feet of copper tubing so he could cook up some paint-peeling Jesus juice that would make you go blind and vote a straight Republican ticket after just one Smoky Mountain Margarita. No, Jim makes moonshine that you can use to run your F-150. Jim is into biofuels, but that’s just one of his many interests. Someone should do a story on this guy. He’s something of a renaissance man—an avid guitarist, amateur filmmaker/photographer/Photoshop buff, monster movie nut, and most of all, a proponent and maker of ethanol. He has an evangelical fervor about biofuels. It’s been around forever, and it’s the wave of the future. Henry Ford, he likes to point out, ran the first Model T’s on ethanol. Hop to it. 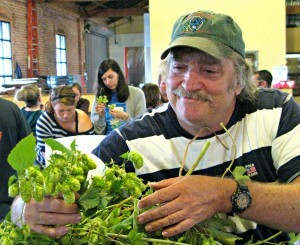 Jim Munro pulls viable hops off the vine at Kettlehouse Northside’s Hop PickingParty. Jim grows his own beets, which he ferments and processes through his own still to produce the go-go juice to run his Ford van. The guy’s commitment to renewable energy is inspiring. So I see him at the K-Hole and I wonder, does he want to make high-test out of hops? Doubtful. But he told me he had secured some land in west Missoula, and was planning on planting a crop of sugar beets to use as raw material for his ethanol project. The idea of growing hops as well seemed like a natural complement to the beets (we can make moonshine AND pale ale! ), so he was full of questions about the role of hops in making beer. As Jim and I sat and plucked and sipped and talked, we found out that hops were used in the beer making process to counterbalance the sweetness of the malted barley. Hops are even allowed under the German beer purity law, Reinheitsgebot (German for “hit me with your rhythm stick”). Malt is kind of the main ingredient for beer, if you don’t count water (and spousal revenge). It’s why most breweries you drive by smell like Campbell’s Alphabet Soup. That’s a childhood memory spike that’s in so deep, every time I drink a bottle of Rainier I suddenly crave a grilled cheese sandwich and an episode of The Brady Bunch. But back to the Hop Pickin’ Party. The pub was nearly full, every table entwined in the sharp-edged, brawny vines that twisted mightily to expose, under their broad, emerald leaves, the hidden clumps of fragrant treasure. The thumb-sized buds grew in tight bunches like clenched pine cones. But these were different. They were flowers. A clump could be plucked five or six at a time with one hand, then deposited into the great half barrel in the center of each table. Brock Gnose of the Kettlehouse appeared at our table, with an apron, gloves, and a clipboard. Safety glassed clamped to his face, he peered down into our table’s barrel. I dutifully dropped the hop into my glass of Double Haul India Pale Ale and let those little yeasty buggers have at. I had bigger fish to fry. When I first walked in, I carried a cloth grocery bag that was stuffed with three pounds of Cascade Hops, Lakeside Hops, and maybe even the rarely seen Hanetown Hops, not seen in these parts since before the WWII internment camps. It was going to take the eyebone of an expert to sort these babies out. They were from my backyard. I’d misunderstood the concept of the Hop Picking Party, and spent a couple of hours trampling my wife’s flower garden, yanking hops off the vines that have laid claim to our back fence. I’ve watched these vines for years, and they’ve increased their domain ever summer. They spread like kudzu does in the south, but to my knowledge kudzu has no known value to mankind. This year the vines made the leap from the fence to an adjacent pear tree, and judging by the astonishing speed of their growth, we’ll either be eating beer-flavored pears in a couple of weeks, or perhaps the next batch of beer you drink from the Kettlehouse will have a hint of backyard Bartlett. Big Al Pils strolled by, and I accosted him with my sack. He scooped a double handful and held them up to his nose. The sound he made was akin to a grizzly bear huffing into a hollow stump, trying to dislodge a beehive. “Mmm,” he said. I emptied my sack into the barrel.